The premise of "Dogfight" is so despicable that an attempt to build a love story around it seems next to impossible. No matter what else comes before or after, book writer Peter Duchan and composers and lyricists Benj Pasek and Justin Paul have to deal with this issue first of all. For the most part, they pull it off, and do it with pizazz and style. Newcomer Caitlin Brooke as Rose is so honest and fresh that her unlikely fling with Marine recruit Eddie Birdlace (Jeffrey Brian Adams) seems plausible. The other Marines usher up a caisson-load of false bravado in advance of their mission to Vietnam which begins the following morning at Oh Five Hundred. They also sing and dance. San Francisco treasure Michael Gene Sullivan shines in all of his parts, especially as the sympathetic fellow vet riding on the bus with Eddie. 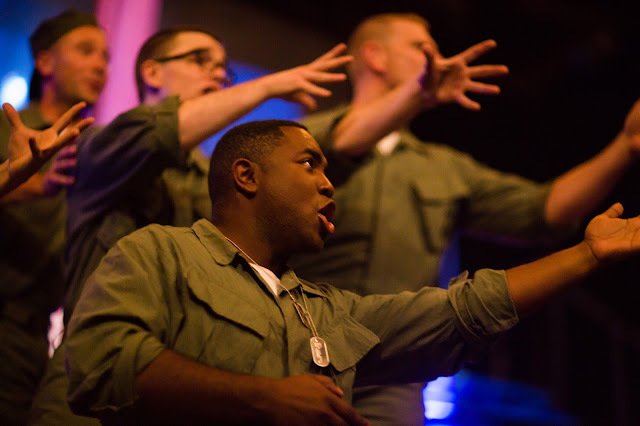 Brandon Dahlquist as Boland is particularly effective as the tough guy Marine and Andrew Humann as Bernstein is the stereotypical tough-talking little guy. The music has fabulous moments. For us, the standout song of the show is Act Two's "First Date, Last Night," featuring Eddie and Rose, which is the one moment where the music brings us to the truth we seek in this romance. Other great songs include "Nothing Short of Wonderful," sung by Rose, and the rueful "Home Hero's Ticker Tape Parade" which brings us all back to the reality of what the war in Vietnam did to so many unsuspecting vets. Do we have problems with a show that won many honors when it debuted off-Broadway in 2012? Well, yeah. You don't get a resolution that makes much sense and that follows a premise that may in fact be a true depiction of a traditional Marine custom but kind of makes you gag. But the concept is daring and truthful. 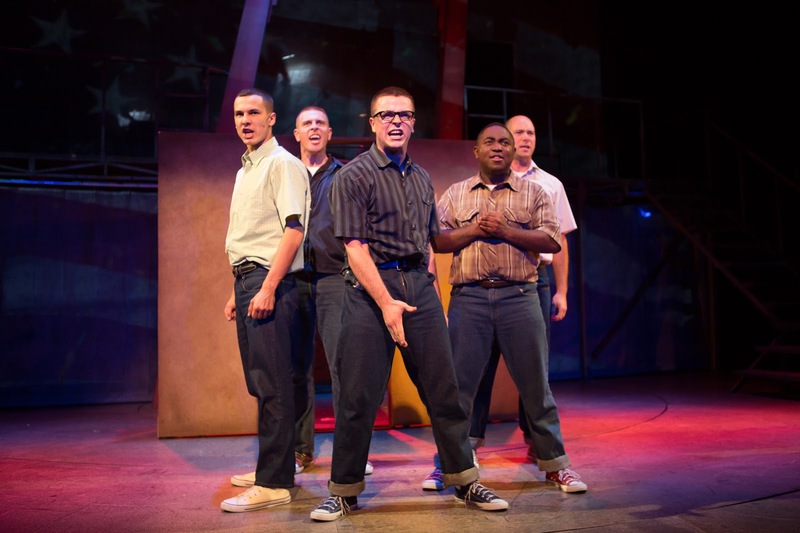 "Dogfight" tells its own story. It's not a pretty one but it's a lot of fun to watch. 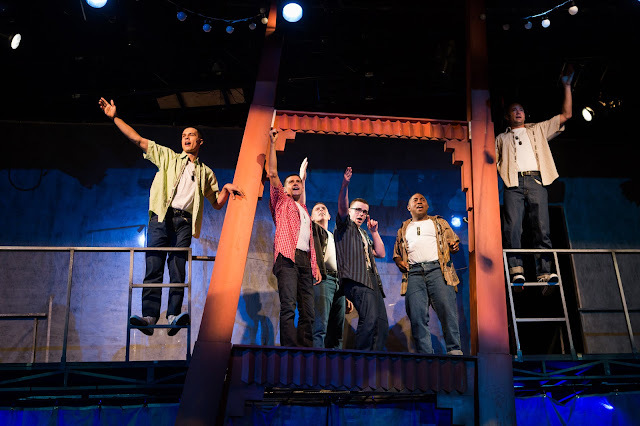 The San Francisco Theater Blog Awards Division awards "Dogfight" Three Stars with a BANGLE OF PRAISE. Caitlin Brooke pulls off a terribly difficult role. 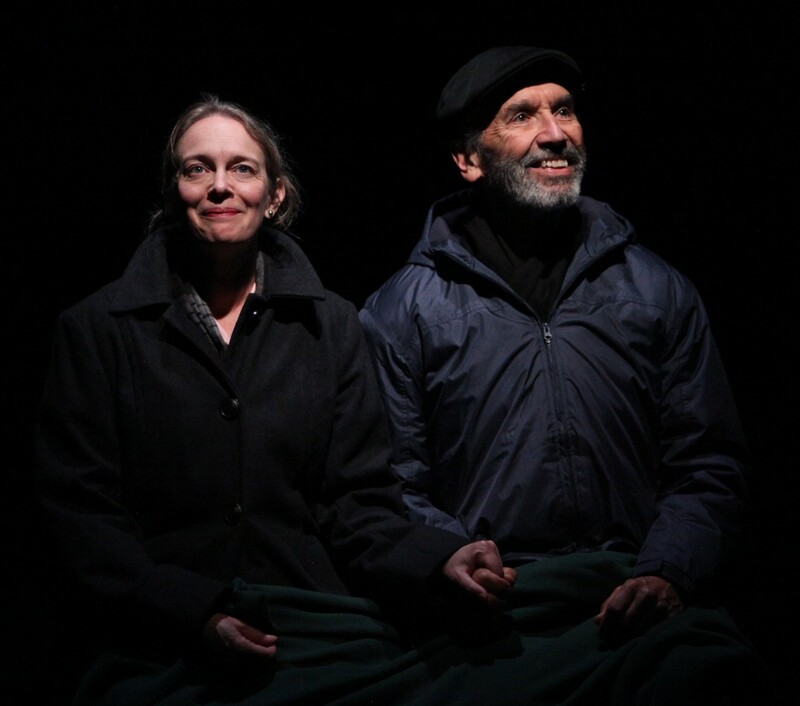 David Lee Cuthbert's lights, English's innovative always-in-motion stage design and Tatjana Genser's costumes complement the story perfectly. 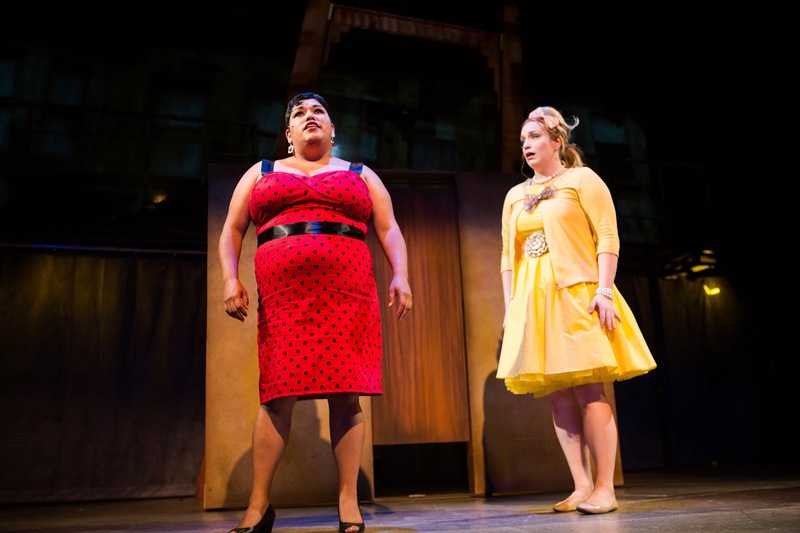 We love the yellow dress. But the BANGLE OF PRAISE has to be for Rose's Right Haymaker. 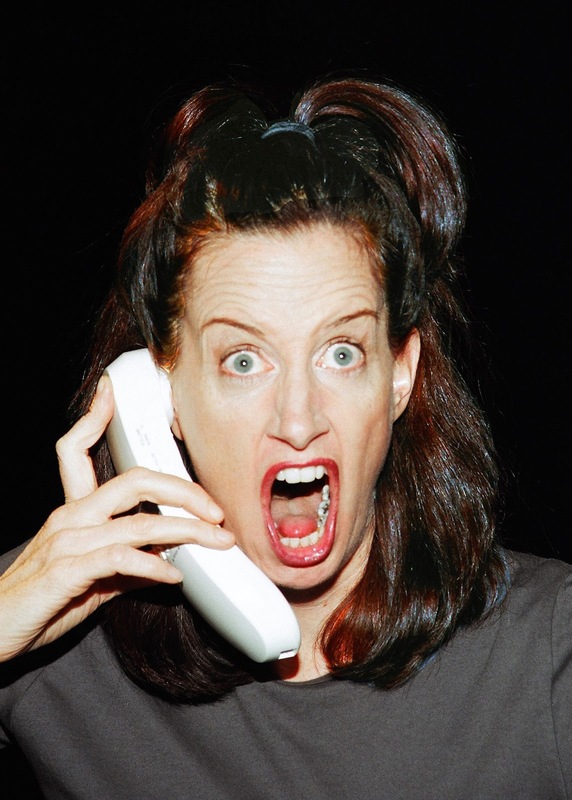 Ethel Merman couldn't have done that. We could use Instant Replay. Though the diner has an American theme, with a red-stooled counter, posted menu of burgers and hot dogs and jukebox filled with Buddy Holly and James Brown, Fred's Diner's actual location is somewhere off a motorway in working class England. Class distinctions pervade every action, as author Penelope Skinner paints a bleak pastiche of longing, abuse and impossible dreams. A disappeared America from the 1950s is only a metaphor here, because none of these characters is going anywhere. 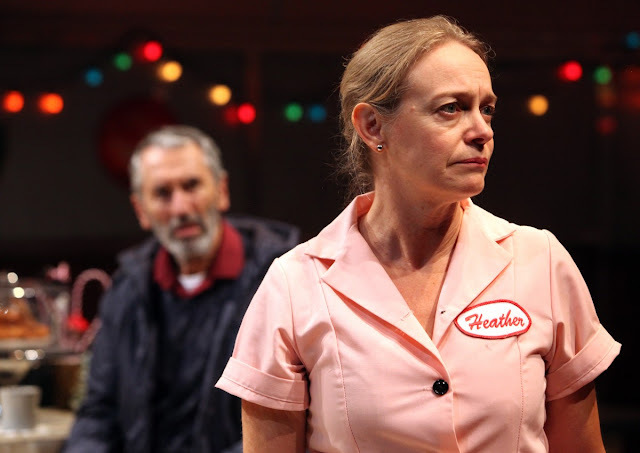 We love Heather, the "older" waitress played by Julia McNeal, who has been passed over for promotion by Fred (Donald Sage Mackay). Fred wants Chloe (Jessi Campbell), who is young and pretty, to have the job, even though Chloe's only qualification appears to be a calculating smile. 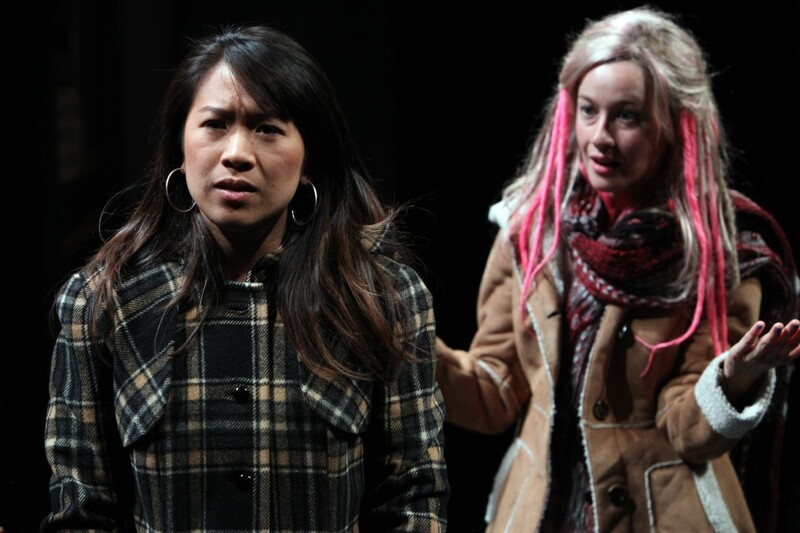 Meanwhile, Fred's daughter Melissa (Katharine Chin) has but one dream, which is to run away from the diner and enroll at Oxford. But she is tethered to caring for her father, as her mother appears to have disappeared some years before, incomprehensibly leaving Melissa with lecherous, drunken Fred. Rounding out the cast are Sunny, played by Terry Lamb as a customer of the diner, and Greg (Nick Day), a local kid with no hopes at all. It's a terrific opening freeze frame, as Heather sits motionless at the counter holding a baseball bat while Fred lies in a puddle of pooling blood on the floor. The ending is not quite as simple as it seems, as we work backwards in time to see how things have gotten to this point. 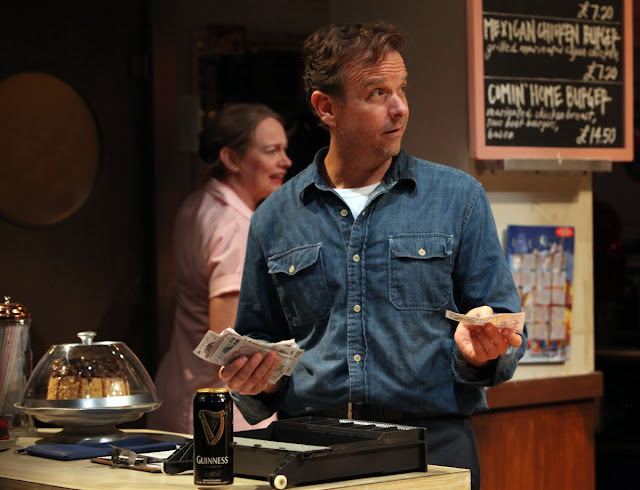 "Fred's Diner" discusses difficult topics worthy of exploration. But we have little motivation to hang our hats on Fred or Melissa, he an overbearing drunk and she a young girl with a telescoped secret. Sonny is a bore, Greg has no chance and Chloe is clueless and self-involved. So, as the show develops, we root for Heather, the only person who seems to understand right from wrong. In the end, Melissa does take a decisive step, but we have a feeling not much is going to change. 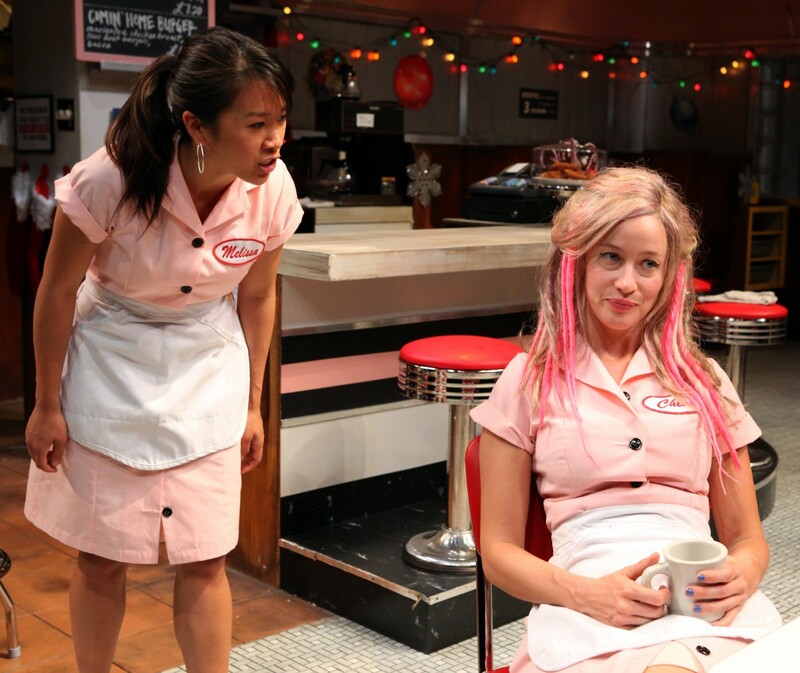 The San Francisco Theater Blog Awards Division awards "Fred's Diner" Three Stars. Erik Flatmo's set design and Stephen Strawbridge's lighting help us follow the numerous stop frames. It's the simple things that work so well at Fred's -- like the look on Sunny's face when Heather takes his hand. 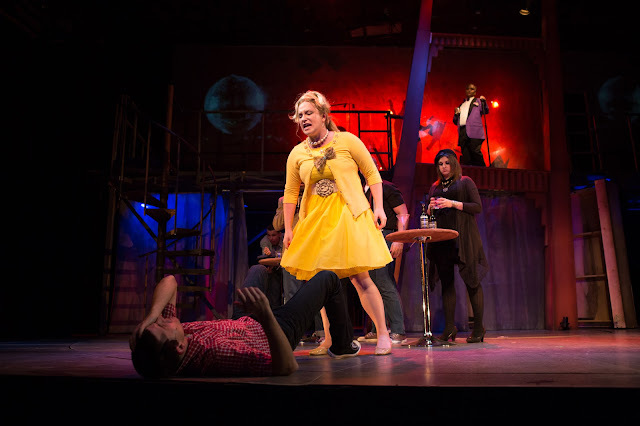 A great play carries you into another world, messes with your preconceptions, makes you first uncomfortable and then exultant as you figure out how you feel about this new world into which you've been allowed a two hour journey. 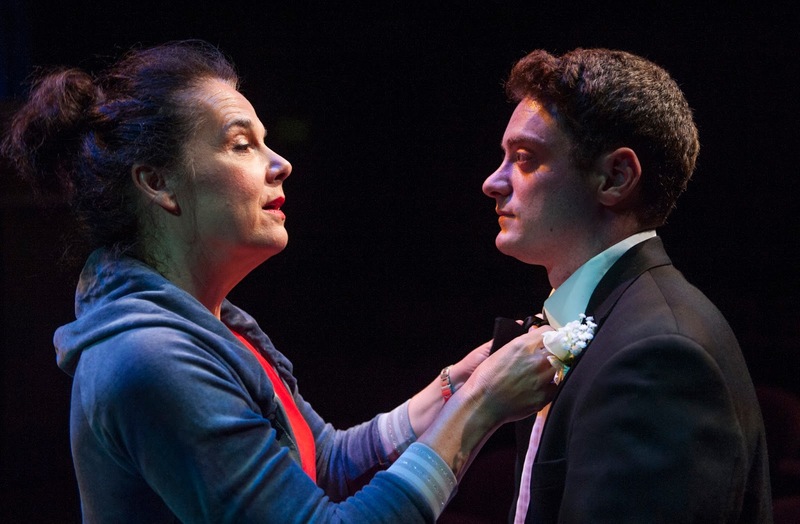 Act One of Sarah Ruhl's "The Oldest Boy" does all of that, as the young mother, played exuberantly by Christine Albright, is presented with a terrible choice. 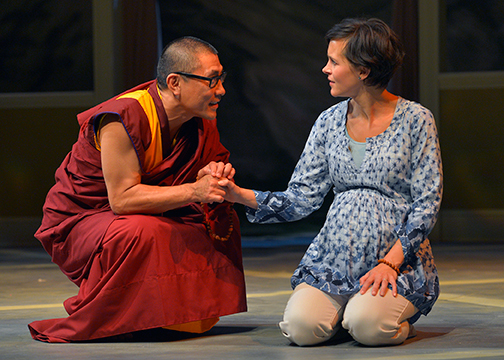 As the intermission curtain falls we have no idea what she will do to protect her son, Tenzin. The problem is, we know exactly what we would do and we're pretty sure she's not going to listen to us. 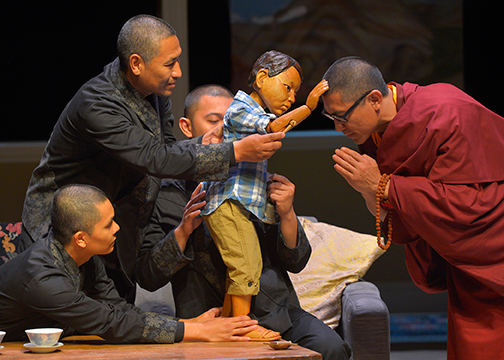 Two Buddhist priests, one a lama (Jinn S. Kim) and one a monk (Wayne Lee), have come to an unnamed American city to seek out Tenzin, who is only three years old but has been identified by the monks as the reincarnation of their holy teacher. They wish to take the boy from his parents and bring him back to India to teach him to become a lama. To them, this is the noblest undertaking for any man. Tenzin's father (Kurt Uy), who is Tibetan, obviously sides with the monks, to his wife's horror and dismay. Then comes Act Two. Time has passed and the mom is pregnant again and she has decided to allow Tenzin to go with the monks. The family is now in India, where the mom has her baby (in a scene stylized to the point of banality) and finally comes to her decision. This is where plot points and production decisions bog down the narrative. 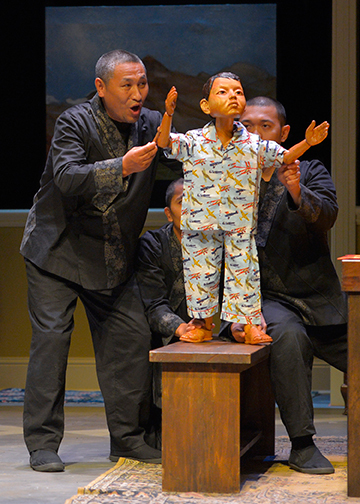 Does the little boy, who is represented by a puppet for most of the play, actually become one of the older monks...or his reincarnated earlier self…or...? 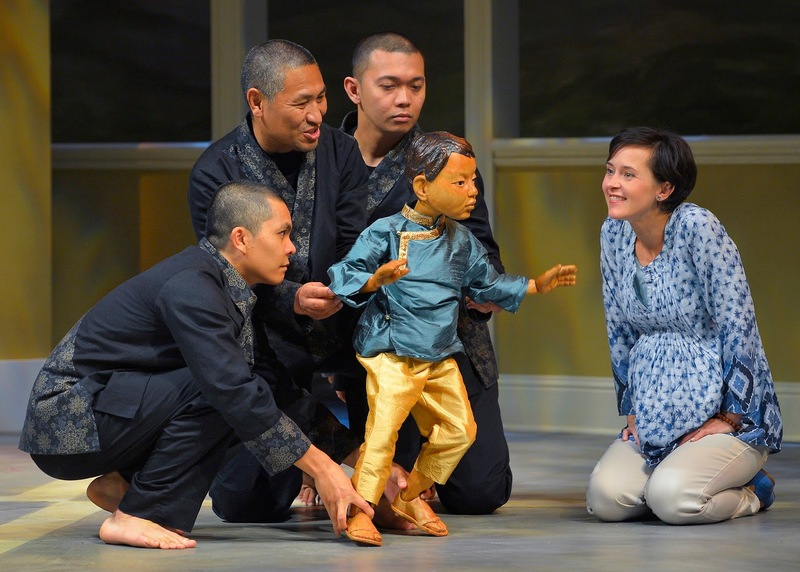 Why does this American child, voiced by actor Tsering Dorjee, speak with a Tibetan accent? Is it true that we, as Westerners, who are said to treat our own parents as convenience items, utilizing them as baby-sitters then dumping them into old-folks homes when they are no longer useful, can never really comprehend the selfless ways of Tibetan Buddhists? 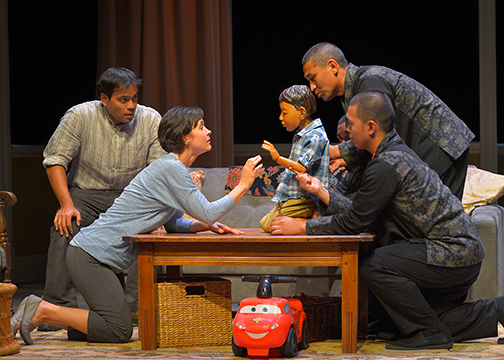 We love the boy puppet, as well as the intriguing decision to use puppetry in the first place (apparently Ruhl specifies puppet or marionette), and of course this is a Sarah Ruhl play so there are many meaningful lines, as well as a touching love scene over a sink filled with dirty dishes. If, as the mom says, "To say good morning is easy, to say good night is hard," then we must agree. This story is so involving that if they shore up the ending we, the audience, will find refuge in both. The San Francisco Theater Blog Awards Division awards "The Oldest Boy" Three Stars. This represents Four Stars for Act One and less for Act Two. Special credit to the production team here -- lights, music, staging and set, all brilliant. We just re-read our review of Ann Randolph's "Loveland" from 2009, when it had its debut at the Marsh and our reviewer, a young man then, awarded the show an enthusiastic rating of THREE STARS WITH TWO BANGLES OF PRAISE. Somehow six years have passed, but though our reviewer may have lost a step, Frannie Potts hasn't aged a day. Her mom hasn't either, nor have any of the other wonderful characters that Randolph brings to life in this brilliant one-woman show. If there is a difference between now and then, we would have to say that the highs are even higher, the laughs longer and the lows more heartfelt. 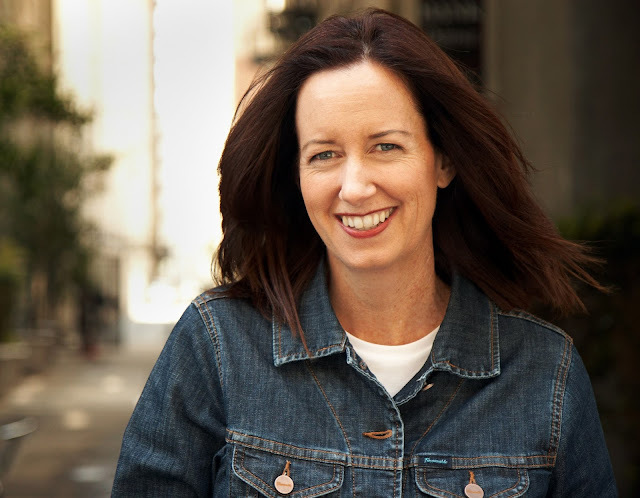 San Francisco is blessed to be the home of some of the best solo artists working and Ann Randolph is a match for the best of them. 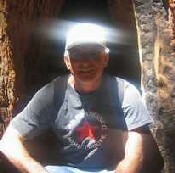 We love Shanti Lifegiver, her wellness coach. We love everything about the flight to Ohio, from Frannie's interpretation of what "feel free to move around the cabin" means, to her absolutely side-splitting sexual fantasy with the Captain. And if you're not sold yet, then the concert she gives the patients at her mother's old-folks' home, featuring numbers like "Waddaya Hangin' On For?" and "Take Your Last Breath Now" should put you over the edge. 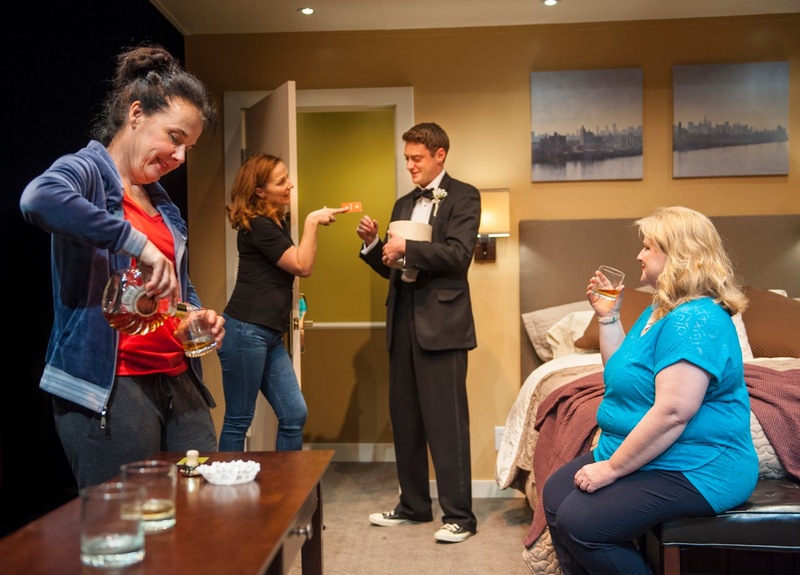 The San Francisco Theater Blog Awards Division awards "Loveland" FOUR STARS this time around. Ann Randolph is better than ever. Four characters in a hotel room, three are old-school stewardesses and one is their pot dealer: what's not to like? Nothing, really. Marisa Wegrzyn's mom was a flight attendant back in the day and the daughter must have absorbed a lot of her mom's horror stories. But "Mud Blue Sky" is less about flying than it is about the relationships of four people dealing with their own issues while caught up in a temporary community. 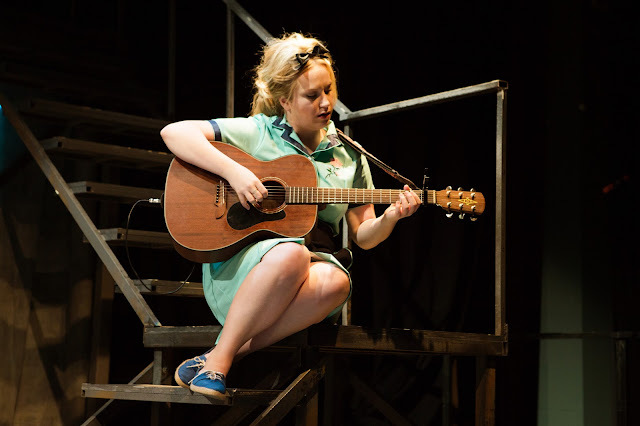 Jamie Jones plays Beth, who enters the hotel exhausted, kicks off her shoes one at a time, with delight the entire audience can feel, then flops down on the bed. Enter Sam (Rebecca Dines), a somewhat younger co-worker who is anxious to get out of the hotel and do some partying with Beth and their one-time co-worker Angie (Laura Jane Bailey) in a local bar. Beth demurs, but she has a reason: she needs to see Jonathan, played to perfection by Devin S. O'Brien, a high-schooler with whom Beth has a previous history. Jonathan, though he has just been jilted by his date for the prom, is tall and handsome, but also young, painfully shy and in need of friendship. He has something to offer each woman, but the most important is his obvious affection for Beth. 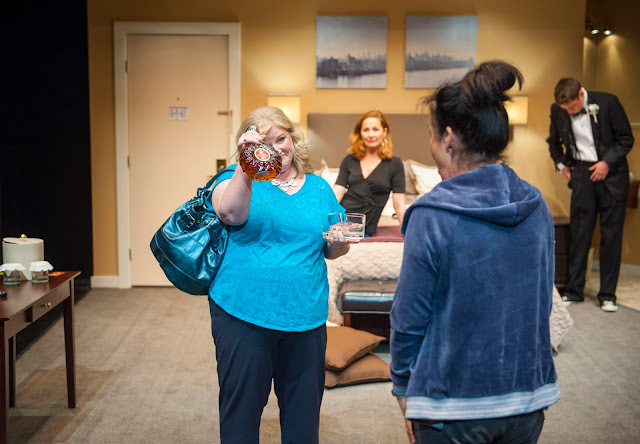 Bailey, as the overweight Angie (she got fired by the airline because of her weight issues), seems especially honest and vulnerable, in contrast to Dines's Sam, who is trying to play a sexpot role she doesn't really feel, due to issues she is having with her own teenager. Jones's Beth is multi-dimensional, and in the end so is this story, as we relate to real life problems in our momentary glance at four everyday people. The San Francisco Theater Blog Awards Division awards "Mud Blue Sky" Three Stars with a BANGLE OF PRAISE. 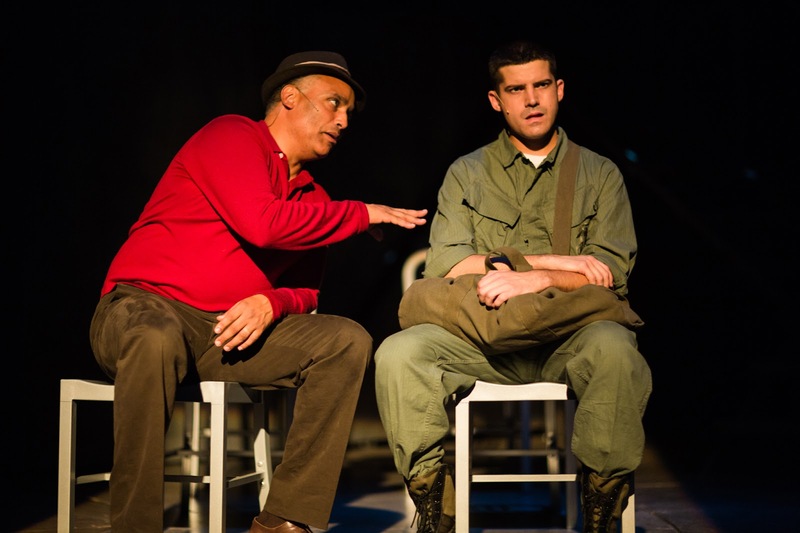 It's a long one-act that never gets tiresome, which is always an indication of fine direction (by Tom Ross). Story and acting deserve the other two stars, and the BANGLE is for Angie's long and touching monologue at the end. Wegrzyn also writes for TV, and the story has a bit of a TV feel to it -- beginning, middle, end, tidy. Nothing wrong with that.